Grilling steak: Not as hard as you think! It’s summer, and that means your grill should be dusted off and ready to go. If it isn’t, go do that right now! There’s nothing better than a steak (and a few beers) on a warm summer night. Grilling the best steak is easy, guys. You could even say the hardest part is choosing which tasty cut of beef ends up on your plate. Will it be the lean flank/skirt steak, the voluptuous ribeye, a sleek New York strip, or something grander like a porterhouse? The options are endless. Endless! When you’re ready to cook, make sure that bad boy has been sitting out on the counter until it’s about room temperature. First clean your grill. Seriously. That residue from your party last Labor Day isn’t going to clean itself. Heat it to 450°F once clean, so your steak get as good a sear as the tan you got earlier. Sprinkle the steak with salt, freshly ground pepper, and a drizzle of olive oil on both sides. Or you can go ham and use a mixture of your favorite spices. If you use kosher salt, freshly ground pepper, paprika, cayenne, oregano, turmeric, chili powder, brown sugar, and cinnamon you’ll be #winning. Place the seasoned steak carefully on the grill. Carefully! Cook for five minutes on each side to give it a killer sear and reach a perfect medium-rare (depending on the thickness of the steak). Use a meat thermometer to confirm the doneness. It should be between 130°F and 135°F. 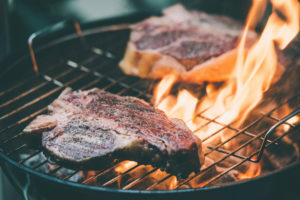 Once your steak is done, remove from the grill, place on a plate, and cover with aluminum foil for five minutes before serving. The juices will reconstitute, giving your steak the perfect combination of exterior sear and internal tenderness. Your steak should be beautiful on the inside and outside, just like you. Now, EAT!